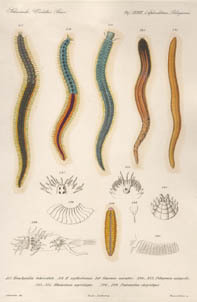 In the 1850s the biologist Professor Ludwig K. (Karl) Schmarda (1819-1908) journeyed around the world and later produced a two-volume monograph describing the worms he collected along the way, mostly in the Southern Hemisphere. He visited Ceylon, South Africa, Australia, New Zealand, the Americas. 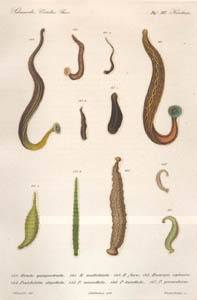 (His 1861 travel book "Ludwig K. Schmarda's Reise um die Erde" probably inspired E. Haeckel's sojourn in Ceylon). 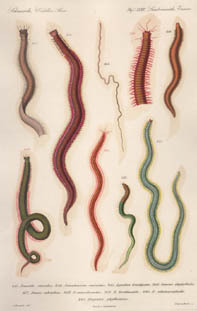 The 191 new leeches, oligochaetes and polychaetes were presented in a monograph now over 140 years old and rare, at least in the parts of the world from which Schmarda took worms. Those who have photocopies of the text will not have the plates in colour. 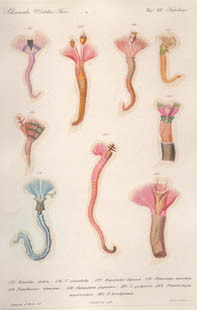 Colour greatly aids interpretation of some of Schmarda's briefly-described species and genera, most of which were illustrated in the plates. "Neue Wirbellose Thiere beobachtet und gesammelt auf einer Reise um die Erdr [Erde] 1853 bis 1857 von Ludwig K. Schmarda. Erster Band. Turbellarien, Rotatorien und Anneliden. Zweite hälfte. Mit 22 colorirten kupfertafeln und mehreren hundert figuren in holzschnitt," published by Verlag von Wilhelm Engelmann, 1861. 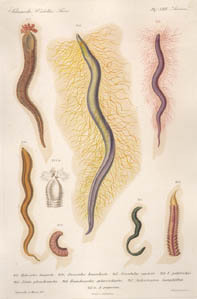 Schmarda's annelid genera in use today include the polychaetes Paleanotus, Notocirrus, Hyboscolex, Pelogenia, and the oligochaete Pontoscolex. 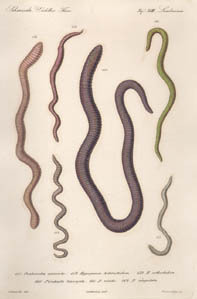 The leech Pontobdella macrothela is type of the genus Stibarobdella. Others of Schmarda's genera such as Cirrosyllis, Pygophyllum and Didymobranchus are tantalisingly mysterious - what were they? Those of Schmarda's type specimens that survive are in the Naturhistorisches Museum, Wien. 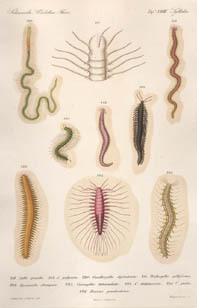 Schmarda Plates, with species names and type localities. Plate 16, HIRUDINEA. fig. 140-147. 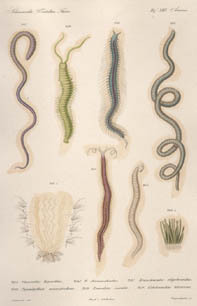 Hirudo quinquestriata - Australia, H. multistriata - Ceylon, H. flava - Ceylon, Haemopsis ceylanica - Ceylon, Pontobdella oligothela - Adriatic, P. macrothela - Jamaica, P. leucothela - Australia, P. prionodiscus - Antilles Sea. Plate 17, NAIDEA. fig. 148-156. Ichthydium jamaicense - Jamaica, I. tabulatum - Caucathale, Nais ternaria - Americas, Aulophorus discocephalus - Jamaica, A. oxycephalus - Ceylon, Aeolosoma ternarium - Ceylon, A. macrogaster - Central America, A. pictum - Caucathale, Chaetogaster filiformis - South America. 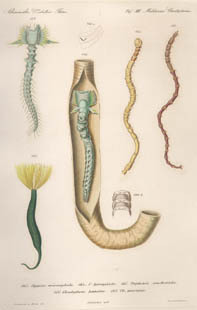 Plate 18, LUMBRICINEA. fig. 157-162. Pontoscolex arenicola - Jamaica, Hypogaeon heterostichon - Quito, H. orthostichon - New Zealand, Perichaeta leucocycla - Ceylon, P. viridis - Ceylon, P. cingulata - Ceylon. Plate 19, MALDANIAE, CHAETOPTERINA. Pherusa tetragona - South Africa, P. bicolor - New Zealand, P. chilensis - Chile, Hermella capensis - South Africa, H. macropalca - Chile, H. bicornis - Ceylon , H. quadricornis - New Zealand. 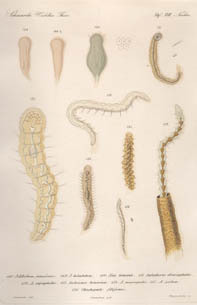 Plate 21, SERPULACEA. fig. 175-183. Vermilia dubia - San Malo, V. annulata - Jamaica, Eupomatus dipoma - South Africa, Placostegus caeruleus - South Africa & New Zealand, Pomatoceros tetraceros - Australia, Cymospira gigantea - Jamaica, C. polycera - Jamaica, Pomatostegus macrosoma - Jamaica, P. brachysoma - Jamaica. 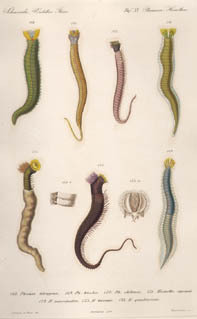 Plate 22, SERPULACEA. fig. 184-190. Protula longiseta - Jamaica, P. appendiculata - Jamaica, Sabella ceratodaula - New Zealand, S. violacea - South Africa, S. phaeotaenia - Ceylon, S. melanchlora - Ceylon, S. melanostigma - Jamaica. Plate 23, SERPULACEA. fig. 191-193. Sabella tilosaula - Chile, S. melania - Jamaica, Spirographis tricyclia - Ceylon. 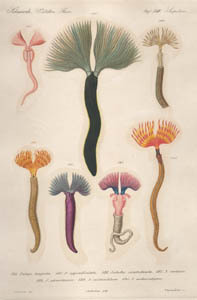 Plate 24, TEREBELLACEA. fig. 194-199. Polycirrus purpureus - Jamaica, Sabellides oligocirra - Jamaica, Terebella plagiostoma - New Zealand, T. heterobranchia - New Zeland, T. macrobranchia - South Africa, Pectinaria antipoda - Australia. 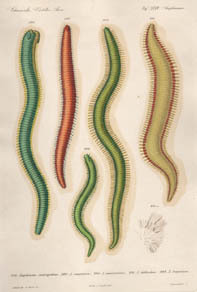 Plate 25, TEREBELLACEA. fig. 200-204. Phyzelia chilensis - Chile, P. viridis - Ceylon, Terebella tilosaula - Ceylon, T. trigonostoma - Australia, T. chloraema - Chile. 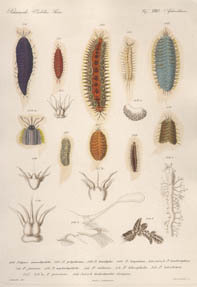 Plate 26, ARICIAEA. fig. 205-210. Oncoscolex bipartitus - South Africa, O. dicranochaetus - South Africa, Branchoscolex oligobranchus - South Africa, Pygophyllum macrotrichum - Atlantic Ocean, Leucodore socialis - Chile, Colobranchus tetracerus - Atlantic Ocean, Brittany. 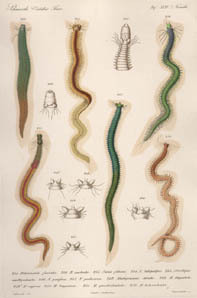 Plate 27, ARICIAEA. fig. 211-217. Hyboscolex longiseta - South Africa, Oncoscolex homochaetus - New Zealand, Cirratulus capensis - South Africa, C. polytrichus - Chile, Aricia glossobrancha - France, Branchoscolex sphaerachaetus - South Africa, Anthostomum hexaphyllum - South Africa, A. ramosum - Jamaica. Plate 28, SYLLIDEA. fig. 218-226. Syllis gracilis - South Africa, S. polycera - South Africa, Gnathosyllis diplodonta - Atlantic, Trichosyllis sylliformis - South Africa, Myrianida clavigera - South Africa, Cirrosyllis tuberculata - South Africa, C. didymocera - Australia, C. picta - South Africa, Hesione proctochona - South Africa. Plate 29, PHYLLODOCEA. fig. 227-233. Macrophyllum splendens - South Africa, M. leucopterum - South Africa, Phyllodoce macrolepidota - Ceylon, Eulalia microphylla - New Zealand, E. capensis - South Africa, Lepadorhynchus erythrophyllus - Jamaica, Notophyllum myriacyclum - Jamaica. 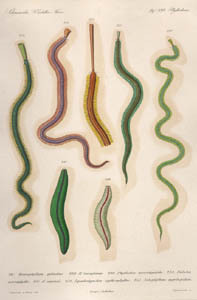 Plate 30, PHYLLODOCEA, NEPHTHYDEA, GLYCERIDEA. 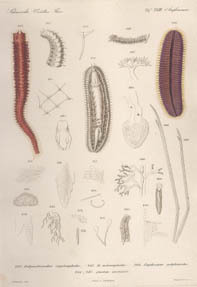 Phyllodoce macrophthalma - Atlantic, P. punctata - Atlantic, Eulalia lobocephala - Chile, Nephthys polyphara - Chile, Glycera tridactlya - Atlantic, G. ovigera - New Zealand, G. sphyrabrancha - Jamaica Plate 31, NEREIDA. fig. 241-252. Heteronereis fasciata - Jamaica, H. australis - New Zealand, Nereis foliosa - Ceylon, N. latipalpa - South Africa, Nereilepas amblyodonta - Australia, N. pacifica - New Zealand, Mastigonereis podocirra - South Africa, M. striata - South Africa, M. lingulata - (no text), M. cuprea - Chile, M. longicirra - Ceylon, M. quadridentata - South Africa, M. heterodonta - Cartagena & Jamaica. Aracoda caerulea - Chile, Nematonereis unicornis - Atlantic Ocean, Lysidice brachycera - Jamaica, Oenone diphyllidia - Jamaica, Eunice adriatica - Adriatic, E. macrobrancha - South Africa, E. teretiuscula - Ceylon, E. schemacephala - Jamaica, Diopatra phyllocirra - Ceylon. 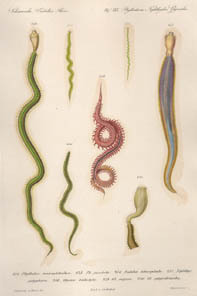 Plate 33, AMPHINOMEA. Didymobranchus cryptocephalus - Chile, D. microcephalus - Chile, Euphrosyne polybranchia - South Africa. 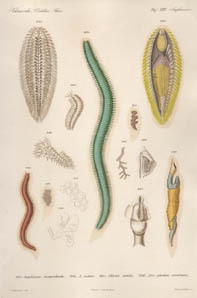 Plate 34, AMPHINOMEA. fig. 288-292. 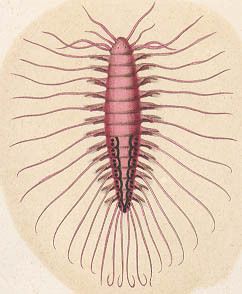 Amphinome smaragdina - Jamaica, A. sanguinea - Jamaica, A. macrotricha - Jamaica, A. latissima - Ceylon, A. longicirra - Ceylon. 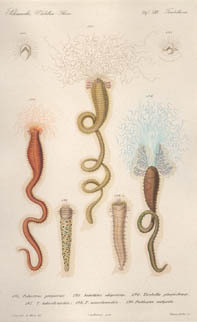 Plate 35, AMPHINOMEA. fig. 293-305. Amphinome encopochaeta - Ceylon, A. indica - Ceylon, Chloeia viridis - Jamaica. 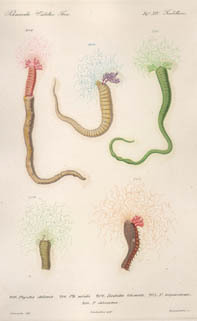 Plate 36, APHRODITACEA. fig. 306-316. Polynoe macrolepidota - New Zealand, P. polychroma - New Zealand, P. leucohyba - Jamaica, P. longicirra - Ceylon, P. trochiscophora - South Africa, P. fusicirra - Ceylon, P. nephrolepidota - Ceylon, P. violacea - Chile, P. lobocephala - Jamaica, P. lobostoma - France, P. peronea - Ceylon, Gastrolepidia clavigera - Ceylon. 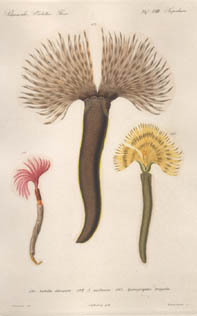 Plate 37, APHRODITACEA, PALMYRACEA. Hemilepidia tuberculata - South Africa, H. erythrotaenia - South Africa, Conconia caerulea - Chile, Pelogenia antipoda - New Zealand, Bhawania myrialepis - Ceylon, Paleanotus chrysolepis - South Africa.